When I talk to people about travel, they often tell me that they would love to go to one country or another, but they always hear that either a country is very expensive or very dangerous or very difficult to get to you, sometimes it's a mix of those. For one reason or another, one of those aforementioned reasons is often enough reason to deter them from traveling to a country. Granted, I am not talking about the process of getting there. For me, getting there is often the most expensive part of the trip, and that is something I have just accepted as being part of travel. While I do definitely agree with the idea that some countries are more expensive than others, I do not believe at all that just because a country is very expensive, a person cannot visit. In fact, if you wait to visit a country, it might actually get more expensive to visit in the future. Whenever I travel, I always go by the mantra that a country is only going to be as expensive as you want it to be. Of course, this is sometimes easier said than done, but it is absolutely possible to follow that mantra and have a very successful and enjoyable trip. I have always tried to follow this advice and generally speaking, I am relatively successful at following it. I followed this mantra when I paid a visit to the little microstate of Monaco in September 2015. Prior, I had never thought of visiting Monaco, and I didn't really know anything about it aside from the fact that it is a very wealthy place where the rich and famous go to have fun. However, after reading Thomas Eccerdt's "Secrets of the Seven Smallest States of Europe," I decided to pay a visit, and I was not disappointed. I did not just decide to head Monaco immediately, nor did I decide to visit only Monaco. At the time of this visit, I had never visited France before, and I figured this would be the perfect opportunity to kill two birds with one stone. Therefore, the plan was to spend time in France (Paris mostly) then make my way down to Nice in southern France and from Nice, I would head to Monaco for a day trip. In order to pull this plan off successfully, I first spent a week in Paris exploring the city and checking everything out. If I had to be 100% honest, Paris is a beautiful city with many wonderful attractions, but I do think it is rather overrated since it is incredibly touristy and rather dirty, but that can be discussed further in a later blog post. After spending a week in Paris, I made my way down to Nice via plane. I initially thought of taking the train which would have been a cheaper option, but I opted for the quicker choice this time. Upon arrival in Nice, I was surprised at how different it was from Paris. Not only was the weather much better, but it was significantly warmer. Unfortunately though, during my planning, I did not plan out much time for exploring Nice. In fact, I spared no time for it, and I kind of regret this. Instead, my plan was to use Nice strictly as a base to get to Monaco. I was aware of Monaco's reputation for being very expensive, so I made the decision that it was not necessary to spend even more cash and stay in Monaco. Since Nice was the closest major city to Monaco and not far away, I stayed at a cheap hotel near Nice Gare (Nice Train Station). The moment I walked into the hotel in Nice, I was actually kind of glad that I was only going to be staying a couple nights The room was so small and cramped that I had difficulty getting my bag inside the room. In addition, the furniture was way too large for the size of the room, so there was very little room to maneuver around, and if I wanted to get up, I had to always move my bag to the bed. If I wanted to sleep, I had to move the bag to the floor. To add to the cramped space, there was no proper desk. Instead, it was essentially like someone attached a 2X4 piece of plywood to the wall and called that a desk. While the room itself was small (definitely not the smallest place I've stayed in but close), it did have a very small kitchenette with a mini refrigerator, sink, and cabinet with some glasses and a couple plates. In addition, there was a grocery store very close to the hotel, so I did not have to go far for any essentials. Despite the fact that the room was incredibly cramped because of the amount of furniture crammed into it, I was only using it as a base for a couple nights, so I did not let it bother me too much. The next morning, my goal was to head to Monaco. From the hotel, it was about a five minute walk to the train station, and within twenty minutes, I was on the train and waiting for it to depart. Purchasing the ticket was easy enough. You just go up to a screen with a list of departure times, find the train for Monaco, choose it, and then deposit the money in the slot. Once you have your ticket, you just validate it and enter the area of the departure platforms. There are a couple ways to get to Monaco; the train or bus, and both options are very simple and easy. Out of personal preference, I opted for the train. Since a lot of people who work in Monaco actually live in Nice because it is cheaper, this train essentially functions as a commuter train. The ride itself was only about 30 minutes, and pretty soon I found myself in Monaco. Once I came out of the station in Monaco, I felt a great sense of accomplishment. I had hit another microstate of Europe! Before starting anything, I immediately headed to the Monaco Tourist Information Office. My goal was to get a passport stamp in my passport. The office was unfortunately closed when I arrived, but later in the day, I would return and get the coveted stamp. Because I arrived on a Sunday, there was not as much activity going on. In fact, when I arrived in Monaco at about 8 in the morning, the place was almost completely deserted with no one out and about. To be honest, I did not necessarily plan to arrive on Sunday, it is just how the travel calendar worked out. Since it was Sunday, pretty much all of the luxury goods shops were closed, but I would not have bought anything anyway. I'm a pragmatic person, and I have little need for material items like that since it just means I have to watch it extra closer. I would always much rather spend money on an experience than a luxury good, but I would be lying if I said I have never purchased a luxury item before. I did once before while I was in Tbilisi, Georgia. Despite it being Sunday, not everything in Monaco was closed. In fact, the main attraction of Monaco was open for business; the Monte Carlo Casino. Monaco is not particularly large, so the casino was very easy to find. However, before I headed there, I decided to take some time to walk around the area and get my bearings. It was a beautiful day, and as I walked around while making my way to the Monte Carlo, I was taken in by the perfect weather with hardly any clouds in the sky. I was also taken in by the large number of luxury boutique shops that were present throughout the town. Because of Monaco's wealth, it was not surprising to see the huge variety of luxury retailers that had stores. I could see stores for Prada, Tissot, Rolex, Armani, Gucci, Mont Blanc, Cartier, and Tiffany's among others. Pretty much any luxury brand you could think of, you could find a store for in Monaco. Of course, they were closed that day because it was Sunday, but I could easily see and imagine the amount of wealth that was present in such a small area. Eventually, I made my way to the Monte Carlo Casino. It was hard for me to believe that I was standing in front of the actual Monte Carlo. I had heard about it many times before, but actually being there in person was quite a different experience. Of course, it was not long before I headed inside. Due to a national law, locals are not permitted to gamble in the casino; only foreigners. Since I was not a local, over the age of 21, and in front of the Monte Carlo, I headed inside the famed place. The lady at the desk first checked my passport to make sure I was not a local, and then I was allowed to enter some of the gambling rooms. If I had to be honest, this is the first casino that I had ever been in, and it just happened to be the famed Monte Carlo. The interior of the casino definitely had a classy look that dated from the early 20th century, and it had all the standard games found at a casino, such as craps, roulette, poker, blackjack, and baccarat. In addition, it also had slot machines that people could play. As I walked around the rooms and took in the decoration, it was not difficult for me to imagine people who had money to burn spending a lot of it here. What I saw was simply a small part of the casino. This was the area for tourists. For serious gamblers, there were other rooms where very significant amounts of money were won and lost. After I looked around some of the gaming rooms, I wandered over to an active poker table and watched a group of Russians playing a game of poker. Now, I do know how to play poker, and as I watched, I was shocked at seeing one Russian in particular losing several hands in relatively quick succession and then dropping 500 euro notes without any hesitation. In the time I watched him, he spent and lost 2000 euros. Since I was in the Monte Carlo Casino and was permitted to gamble, I decided to try my luck, but I avoided the table games like craps, roulette, blackjack, and poker. While I know how to play poker and blackjack, I wanted to try to make my money last a little bit longer than 1 minute. Plus, I am not that good at them. Instead, I headed to the slot machines and played a few games. At one point, I was actually up about 25 Euros. However, after some losses, I tried to make it back up and ended losing everything except for 1 cent. I learned an important lesson that day. It's better to quit when you're ahead. I should have followed that advice, but regardless, it was a fun experience to gamble in the famed Monte Carlo Casino. After I finished exploring the Monte Carlo Casino, I continued to explore everything I could in the time that I had. By this time, more tourists had arrived into the country, so it was significantly more crowded than before. 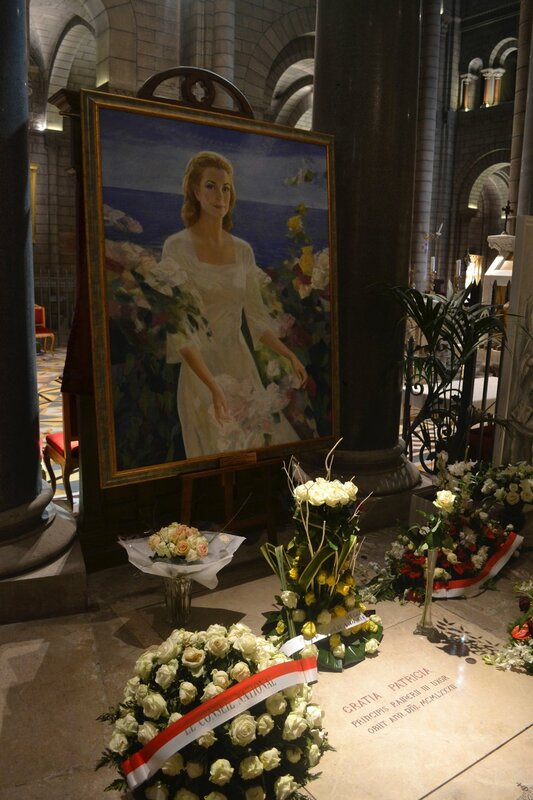 During my explorations, I checked out the Saint Nicholas Cathedral in order to see the grave of Grace Kelly, who was an American actress and who married Rainier III to become Princess Grace. Even though she was killed in a car accident in 1982, I still had to stand in line and wait in front of others to file past the grave. After visiting the Cathedral, I continued to explore and take in the sites and paid a visit to the Oceanographic Museum which had a fascinating collection of sea life and fossils. While I was visiting there, I had the opportunity to touch one of the stingrays that were swimming in an open tank that allowed people to touch. Even though I spent an entire day in Monaco, I still didn't feel that I saw everything. However, I really enjoyed the time I did spend there. Monaco is a country that is often overlooked by the appeal of southern France, but it certainly has its unique quirks. In addition, it is one of the cleanest places I had ever visited. If I had to be honest, I think Monaco was cleaner than even Switzerland and Liechtenstein. In terms of cost, I actually didn't spend a whole lot of money during my visit. The only significant amount of money I spent was about 50 euros in the Monte Carlo. Other than that, the cost of going into museums and the Prince's Palace was pretty standard for what I would find in the rest of Europe. Most importantly though, the best sites in Monaco were completely free! It did not cost anything to walk around and enjoy the breathtaking panoramas of the city and its environs. Now, is Monaco an ideal place for budget travelers? If you can live with not having to buy luxury items or eat in fancy restaurants then absolutely yes! I came to Monaco with a plan to be reasonable with money, and I spent more or less about the same that I would have spent on a day trip elsewhere. Even though it is highly unlikely that I will ever relocate to Monaco, it is an absolutely beautiful country, and it is definitely a place I would like to return to in order to explore more. If you've been to Monaco, what did you think? I'd love to hear your thoughts.